The shirtless man had dived several times into the sea trying to locate family members. This was where his house was located before the tsunami struck. More than 30 families were swept away by the tsunami at this location in Palu. IKHWAN Mokhtar, from the Malaysian Red Crescent (MRC), has not taken part in a humanitarian exercise overseas. Most of his work on disaster relief is within the country, spread over more than 12 years, beginning with rescue work in several Kelantan floods. Early this month, Ikhwan and his colleague, Zulkarnain Musa, also from the MRC, found themselves en route to Sulawesi, Indonesia, which was hit by a massive earthquake and tsunami on Sept 28. Zul is a seasoned campaigner, having seen action in some of the most painful disaster areas of the world. The 2004 Aceh tsunami was one such location, a humbling experience for anyone involved in disaster relief operations. MRC sent them to Sulawesi as an advanced team on a fact-finding mission before it despatches a full-scale relief team as part of the rebuilding work on the island. The earthquake and tsunami in Sulawesi were so bad that travelling to Palu, one of the worst-hit areas, was a major problem. The runway of Palu airport was partly damaged, which made landing and taking off dangerous and risky. But relief aircraft, including the A400M from the Royal Malaysian Air Force, landed several times sending relief items to the grief-stricken area. Zul and Ikhwan were tasked with getting as much information as possible before MRC sends a fully-fledged team of volunteers to Sulawesi. Being part of an international organisation, the International Federation of Red Cross (IFRC) and Red Crescent, MRC has certain protocols to adhere to before sending volunteers in any rescue mission. MRC works closely with Palang Merah Indonesia (PMI), which is a member of the IFRC and the national society for Indonesia. In any disaster operation, coordination between relief agencies can determine success or failure. 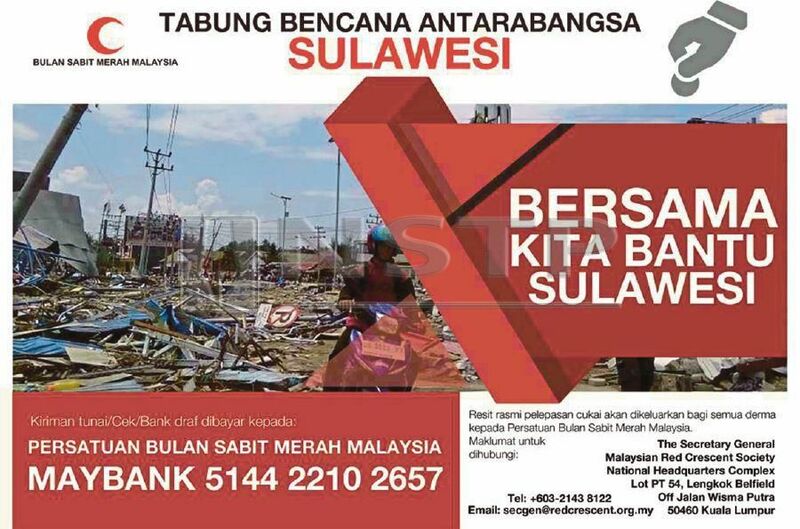 MRC poster for donations for the International Disaster Relief Fund for Sulawesi. Interested donors, please refer to the poster. Let us hear what Ikhwan has to say regarding his first overseas mission: “When I reached Palu, I saw survivors sitting under canvas sheets to protect themselves from the sun. That was all they had. “They stared blankly into space, unsure of their future and deprived of their homes and property. “It was a humbling sight for me. They did not have enough food and water supply was short. It was sad. My task was to help gather information as to how we can assist in getting these people proper water, sanitation and hygiene facilities. Working closely with PMI, the two went about collecting data while helping out with basic relief operations, such as distributing food and other items. I asked Zul if he saw anything different from his previous missions in Indonesia, Myanmar and the Phillippines. I wanted him to compare the situation in Palu with other disaster areas. He said: “Every disaster brings with it different challenges. In Palu, all of us were reminded to be on full alert because there were daily tremors and aftershocks, often a few times a day. It was scary. “In Aceh in 2004, I saw dead bodies everywhere. It was devastating. Everyone sent to do relief operations in Aceh cried, some were so emotionally disturbed that they had to be sent back to their country of origin. “In Palu, I saw one sad incident. A seaside village comprising 33 families had their houses swept away and buried by the tsunami. Many lives were lost. “One of the survivors, with no diving equipment, dived many times into the sea trying to locate victims, which included his immediate family members. The sea is about 20m deep. Yet the man dives every day hoping to find victims and bring them up for proper burial. He just would not give up. “It was a heart-breaking sight. Many are in a state of shock. 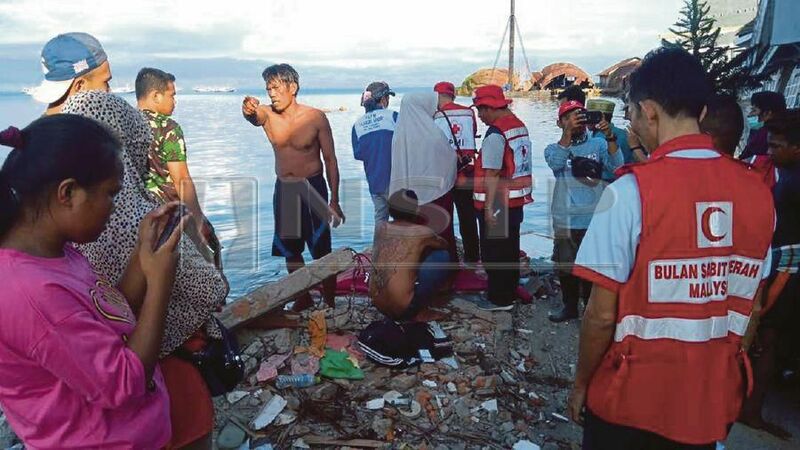 In the first few days of the tsunami, many survivors left Palu. They ran away as far as possible from the disaster area, believing that they would be saved. “Indeed, they were. Gradually, they returned to Palu to confront a future which they described as dark, bleak and uncertain. They have lost everything. We have to provide them with clothes, shelter, food, personal hygiene kits and other basic necessities. “Our priority is to ensure that they have enough clean water and proper sanitation,” the 40-year-old father of five said. In all disaster areas, this has always been the number one task before embarking on more relief operations. Often, disasters like earthquakes and tsunamis will change one’s live forever. Ikhwan and Zul have both returned to Malaysia and MRC has despatched two more staff to continue the fact-finding mission. The two MRC staff in Sulawesi are Rozalla Iskandar Mohamad and Jerome Conahap. They give daily situation reports that would provide more lasting assistance to the survivors.